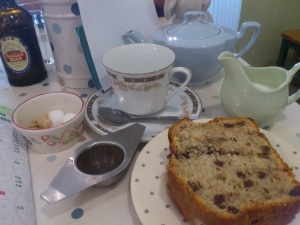 I imagine there are probably umpteen tea rooms called The Vintage Café around the country, so it's nice to see one making an effort to actually have a vintage theme, rather than just have some old cups and saucers and pay lip-service with the name. Don't get me wrong, vintage crockery is in evidence here, and plenty of it (aside from cup and saucer, the tea comes in a pot and the milk comes in a jug - only the stainless steel strainer let the side down, but was at least an indicator of loose-leaf tea). But more of an effort has been made. The vintage theme continues in the decor and goes beyond tea - I seem to recall a vintage dress being in the window too, which was a nice touch. Of course all of this stylistic frippery is to no avail if the tea's no good. Fortunately for us all then, this Vintage Café serves a good selection of the basics (English breakfast, Assam and Earl Grey), as well as Tea Pigs (chamomile, peppermint and lemon & ginger). All of the above are priced at £3.40 for a good-sized pot that is advertised as "for two" but I polished it off myself. There'a good range of coffees too, if you're that way inclined, plus old school soft drinks including ginger beer which, I am told, is very tasty. In other words, there are plenty of options to choose from when it comes to washing down your cake, because you will want a slice of something from the wide (and tasty) range of offer. In summary then, here's a fairly new-looking café that is playing the vintage card hard, and backing it up with decent fare. You'd think it would do well in Eastbourne, a place that has a high retirement population. Of course, it also has a very seasonal population too, so fingers crossed there is enough trade for the Vintage Café to prosper, and that it can differentiate itself from the crowd enough to thrive when competing with the seaside fish'n'chip crowd. Time will tell, I guess.